A picture is worth a thousand words but the latest photo from ‘Gangster Squad’ just says one … cool! So cool in fact, that we’re on our way to pick up a few new suits and reignite the worlds love for a good fedora before ‘Gangster Squad’ opens in cinemas at the end of the year. You’ll be able to trace the thread of cool back to The Popcorn Junkie. Standing in front of LA City Hall from left to right are Michael Peña, Ryan Gosling, Robert Patrick, Anthony Mackie and Josh Brolin. 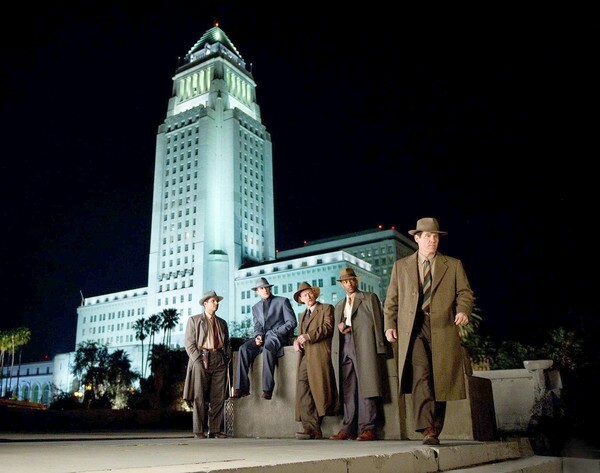 Directed by Reuben Fleisher of ‘Zombieland’ fame, ‘Gangster Squad’ tells the story of the LAPD’s fight to keep the East Coast Mafia, run by Mickey Cohen, out of Los Angeles in the 1940s and 50s. Sean Penn is playing Cohen and rounding out the super cool cast are Emma Stone, Nick Nolte and Giovanni Ribisi. ‘Gangster Squad’ is released 1 November 2012.